Jackson Blvd. current conditions. Photo by Matt Fridell/Tallgrass Landscape Architecture. At the 2017 Western Planner conference, Charles Marohn, founder of the advocacy group Strong Towns (www.strongtowns.org), reviewed the benefits of tackling large public works projects in smaller incremental steps. The core of Marohn’s message is that instead of pursuing multi-million dollar infrastructure investments that result in permanent and big changes, test out the design themes first in a scaled down version. 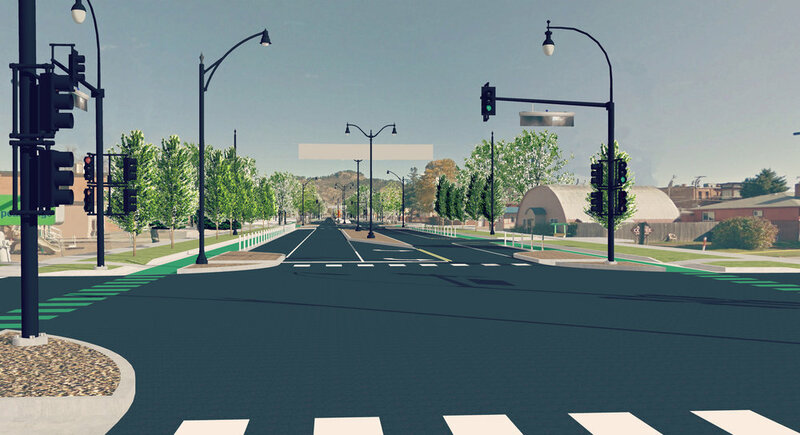 This approach recently played out in Spearfish, South Dakota as the community spent the last year discussing options for the renovation of a key street, Jackson Boulevard, beginning with an expansive (and expensive) new vision for the street and ending up with something significantly different. Jackson is the primary gateway into downtown Spearfish. Once the driver leaves Interstate 90, the view along this street is framed by quaint neighborhoods on both sides and in the distance, Crow Peak invites the explorer to hike her trails to a breathtaking summit at just over one mile above sea level. This major street has existed for over 125 years. The current four-lane configuration is within a 100 foot right of way and has existed since the 1970s when the Interstate highway was built. Drainage issues, pavement and sidewalk deterioration, plus a host of the usual suspects of aging infrastructure prompted the city to begin planning for a major upgrade of a mile long section of this street that originally was to take place in 2018. Our citizens are a caring and involved group of people that want to be a part of major decisions and Jackson’s remodel was no exception. Knowing this, the city initiated a citizen-driven design process in February 2017 and an extensive public meeting campaign was started which included mailed postcards to the landowners along Jackson, as well as invitations posted on the city’s website and social media. Residents use templates to discuss options. Photo by Matt Fridell/Tallgrass Landscape Architecture. People were able to vote for ideas they liked using colored sticky dots.Photo by Matt Fridell/Tallgrass Landscape Architecture. The first public meeting filled the City Council chambers with over 60 people as the design team represented by AE2S/Civil Engineering, Olsson and Associates/Traffic Engineering and Tallgrass/Landscape Architecture rolled out every idea possible for what could comprise a new vision for Jackson. The public was invited to write down their comments and attach them to the various idea boards that included landscape medians, new bike lanes, wider sidewalks, updated street lights, public art, street furniture, and the like. Post-it notes covered the idea boards with some instances of one person writing down a comment and another who wrote something completely opposite. People were able to vote for ideas they liked using colored sticky dots. Street design templates were used like paper dolls as people experimented with different street layouts and configurations to see what they liked the best. From all this input, the design team was then tasked with combining hundreds of ideas and concepts into one cohesive vision. In May of 2017, the team returned to the City Council and presented their design proposal using illustrations of the before and after scenarios to depict the plan. a roundabout at one of the intersections. All these features along with the standard underground utility work pushed the preliminary price tag to $7 million plus. Before; existing 4 lane Jackson Blvd. Photo by Matt Fridell/Tallgrass Landscape Architecture. Proposed “after” using a Road Diet design theme. Graphic by Matt Fridell/Tallgrass Landscape Architecture. As the engineering team began to narrow down what would be included in the construction plans and arrive at a final budget, public opinion of the plan began to shift, significantly. Concerns over the roundabout, the reduction in driving lanes, the loss of curbside parking to bike lanes in the commercial section of the street, and the overall cost emerged from citizens – some of whom were involved in the early 2017 conversations, and some who were entirely new to the project. In December 2017, a final public input session was held and another round of sticky notes and comments surfaced that did not reflect the same changes and street amenities as when the project first started in February. Like a page torn out of the Charles Marohn playbook, one citizen suggested at the meeting that the city should just stripe Jackson Boulevard into the reduced lane design and see if it works before investing so much money in landscape medians. Finally, the City Council elected to retain the current four-lane configuration with the potential to add in some enhancements such as the upgraded crosswalks, and possibly the bike lanes. With only 100 feet of right of way to work with, as of this writing, it remains to be seen if there will be enough space to fit these elements in since they were part of the Road Diet design theme. Proposed roundabout at Jackson and Ames Ave. Graphic by Matt Fridell/Tallgrass Landscape Architecture. Over time, opinions will change. Be aware of extraneous circumstances. As the design discussion on Jackson was unfolding, a major downtown building project along Jackson Boulevard required the closure of one of the driving lanes at the intersection with Main Street and resulted in traffic back-ups. This scenario formed the assumption in many people’s mind for how Jackson was going to function with the reduced lanes. Here again, educate and inform when the opportunity presents itself. Plan and deploy projects incrementally, whenever possible. Small but continuous change allows the public time to accept the ‘new thing’. A few years ago, one of the traffic signals on Jackson was accidentally damaged at the intersection of Canyon Street, which caused the city to remove all the traffic signals at this particular intersection, temporarily. For several months, drivers navigated around a stop sign that had been placed dead center at the intersection in somewhat a mini-roundabout configuration. It wasn’t long before the flow of traffic around the stop sign became the new normal before the city installed the new replacement traffic signals. Another example of incremental change (although not the same scale and scope as the Jackson Boulevard project) is at Interstate 90’s Exit 14 in Spearfish, where a brand new single point urban interchange is nearly complete to replace the old diamond style interchange. Over the past 18 months, as the contractor completed and opened new lanes, drivers cautiously navigated the area with the assistance of signage and traffic cones directing travel. By the time the actual traffic control signals are installed this spring, the learning curve will nearly be over. In summary, projects that involve major changes in local street design and long timelines to implement those changes always will be vulnerable to shifts in public acceptance. As planners, our job is always to focus on process transparency even if it means the great ideas don’t get implemented, or even if only a part of the great ideas gets done in incremental fashion. All is not lost. The citizen who suggested that we try out Jackson Boulevard as a three-lane street with just painted lines is probably on to something because it would allow our community a chance to try before they buy, so to speak. Will Jackson Boulevard evolve from a four-lane standard roadway to a two-lane parkway? Time and public opinion will tell. Jayna Watson, AICP, RLA is is the City Planner for the City of Spearfish, South Dakota. She also serves on the Editorial Board for The Western Planner.